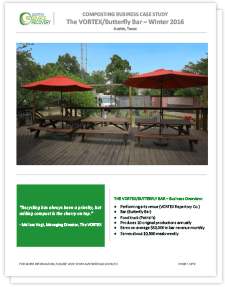 The Case Studies presented below showcase local businesses that have found effective means to implement recycling, composting or other zero waste practices with Austin Resource Recovery staff guidance. If you’d like to receive advice on starting or improving a program at your business, contact our Business Outreach team at commercialrecycling@austintexas.gov or 512-974-9727. Challenges. Hardin House is a private dorm in West Campus, directly west of the University of Texas. Each August, 229 women move in during a 2-day period, producting a large volume of boxes, plastic film and Styrofoam. Yearly turnover also makes recycling education challenging for director Kathryn Parke and staff. Challenges. Nature’s Treasures previously self-hauled waste from their operations, including a rock depot, a retail store and a community event center for classes, fairs and rentals. 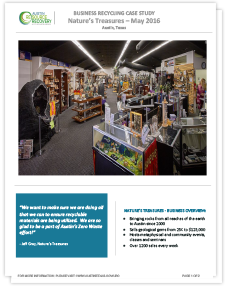 Nature’s Treasures staff was aware of the URO, and looking for guidance on how to make it cost-effective for the business. Challenges. 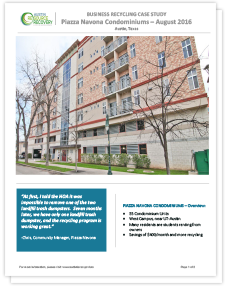 Piazza Navona Condominiums' door-to-door (valet) trash and recycling program was struggling. A low participation rate from student residents, and services did not align with hauler services. Additionally, valet services were offered 3 times per week, but its two landfill trash dumpsters were serviced daily, adding costs. 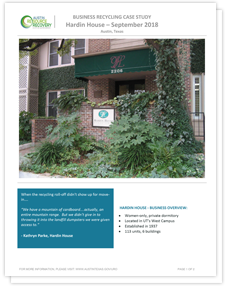 Obtaining residents' contact information was challenging since most units were leased by owners. Challenges. As a nonprofit organization, The VORTEX struggled to fund a composting program. The Zero Waste Business Rebate enabled management to jump-start a program for both employees and customers. Challenges. 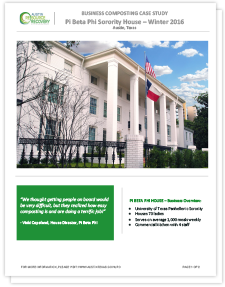 The UT-Austin West Campus sorority house faced multiple obstacles implementing recycling and composting. Challenges included increasing participation, educating new residents and getting effective programs in place. Challenges. The property manager's primary concern was complying with the Universal Recycling Ordinance (URO). Additionally, as new phases of the complex were build, they needed to adjust trash and recycling services. 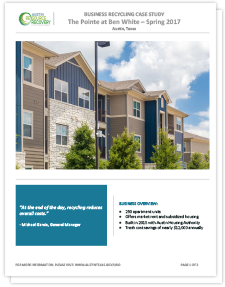 Another challenge was engaging tenants upon move-in to create lasting recycling habits and build a successful recycling program. Challenges. 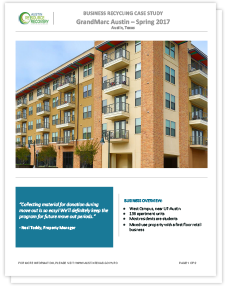 Each summer, students move out of GrandMarc apartments after classes end at the University of Texas. In a typical year, significant volumes of reusable and recyclable material are thrown away during move out. GrandMarc contracts for a roll-off trash dumpster every summer to capture the additional material. The property manager wanted to donate material but was unsure how given the property’s layout. Challenges. Pearl St. 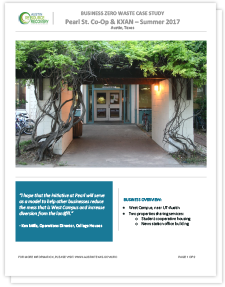 Co-Op, owned and operated by College Houses, and KXAN share a space-constrained alley in West Campus. For years, both businesses managed their own waste services and struggled to combat continuous illegal dumping. It was also commonplace for parked cars to block dumpsters, resulting in missed pick-ups.